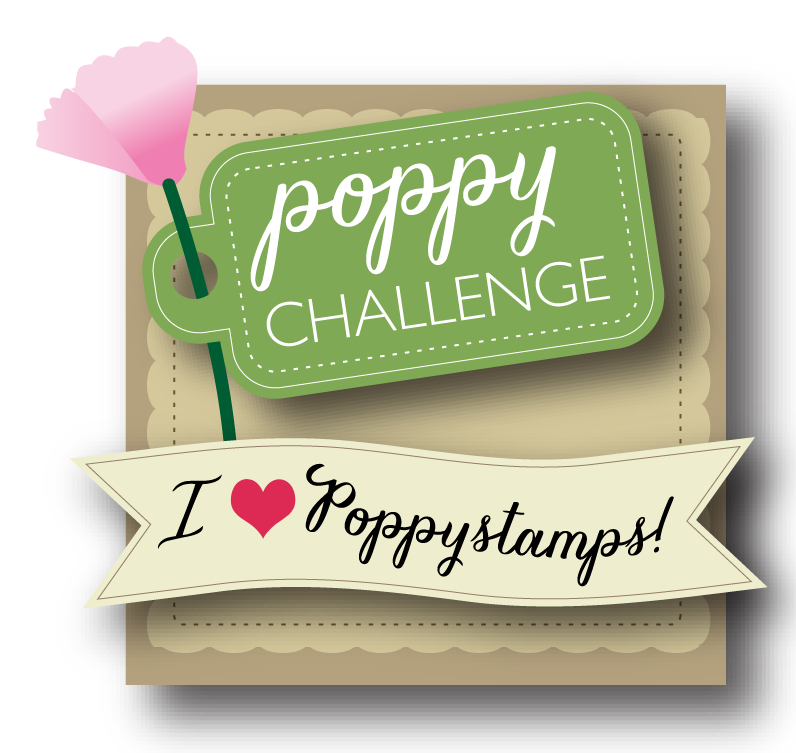 Hello, Hello....I am excited to announce that Poppystamps has begun having monthly challenges. 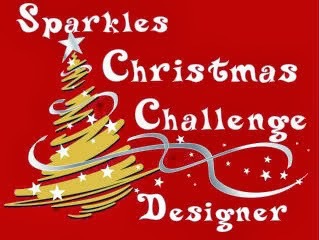 And I'm super excited to be part of the very first challenge. The theme of this challenge is: FALLOWEEN isn't that a cute name. 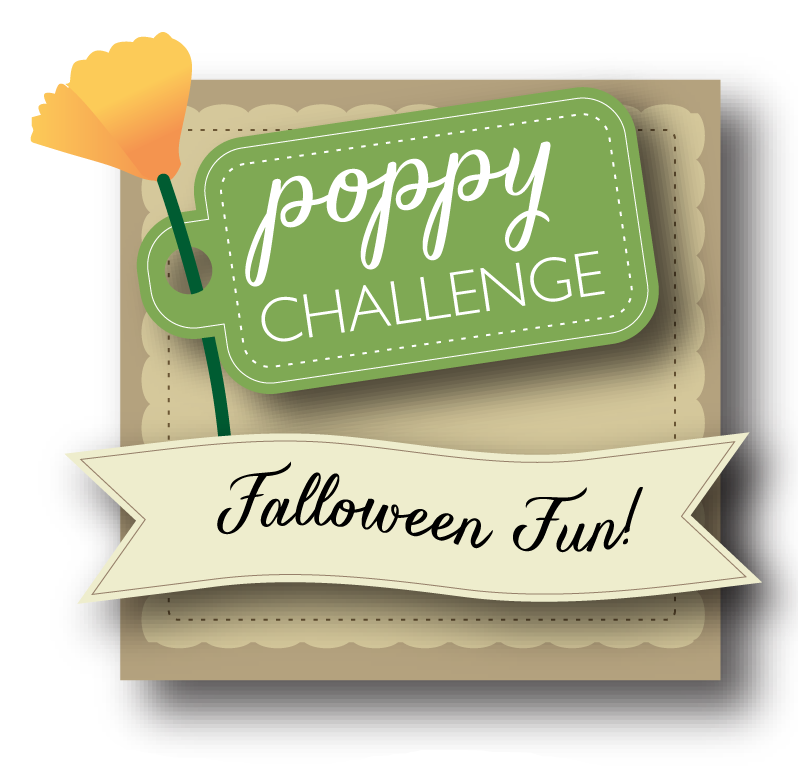 For all the ins and outs of joining the Falloween Fun Challenge. 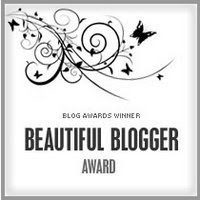 Please go to the Poppystamps blog. You'll find everything you need to know. And don't forget to add your card to the challenge. As you can see, I went with Fall, or as to many of my friends....Autumn. I wish I knew why America and Canada use the term Fall and the remainder of the world uses Autumn. All I can think is that's when leaves fall. Not very creative of we two Northern Countries. 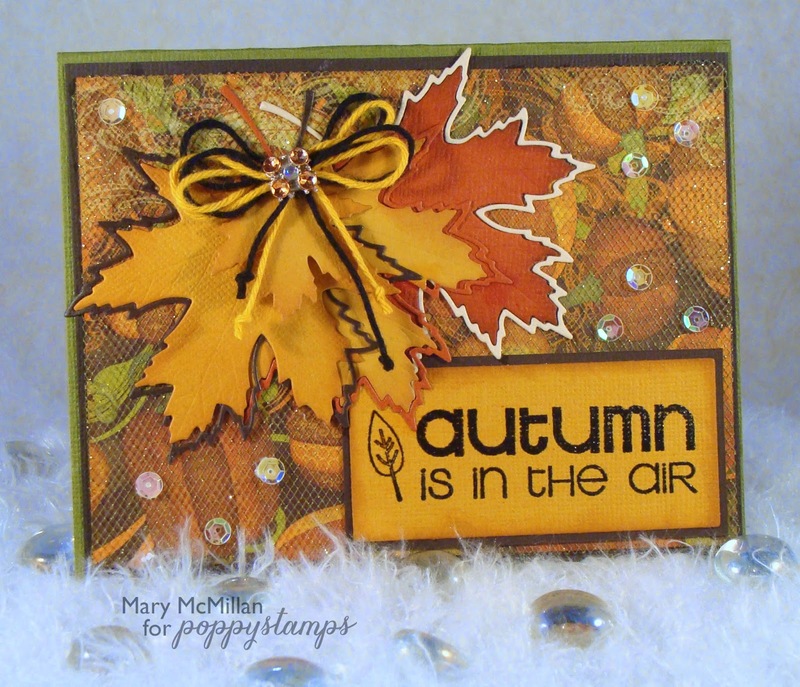 So today I am posting Autumn and for this card I used the Poppystamps Maple Leaf. I get excited by new dies but this die REALLY REALLY has me excited. Why? Because it's like getting two dies in one. See what I mean? There is a solid leaf and the outline leaf all in one. Genius I say! I didn't know that when I ordered this die. Imagine how happy I was seeing it. This is what I did....I had some Autumn paper left over from a class I taught last month. So the base of my card is that paper framed onto brown and then onto green cardstock. I covered the decorative paper with a glittered netting. Then I die cut the leaves in a few colors and sponged Tea Die colored ink on the outside edges. I did a little mixing and matching so the outline was different than the leaf. 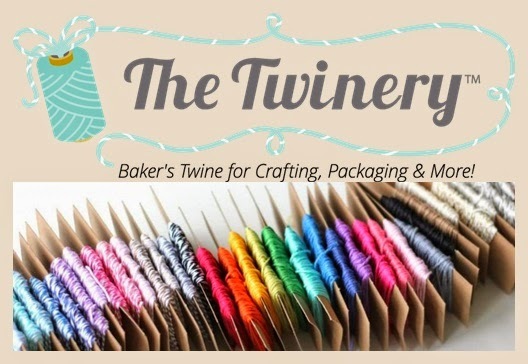 If you look closely to the first photo, you will see a smaller Maple leaf under the twine. I'll tell you about that one later... I then tied some twine and added some bling. I glued this to the card, added the sentiment and some Sequins. See the little Maple leaves on the left side. These are the same leaves I talked about being under the twine. Sweet little leaves don't you think? This time I used netting over the green cardstock that and I then diecut the Leaf Silhouette twice and glued the brown outline to the netting and filled in the leaves in orange. I like it. Well, that's it for today. I hope you play along with the Falloween challenge. I think the challenges are going to be loads of fun! I'm excited to see what you create. 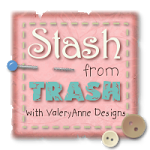 Don't forget to add your creation to the Poppystamps blog page. So romantic card Mary! Love the autumn colours you used! Gorgeous. Hi Mary . 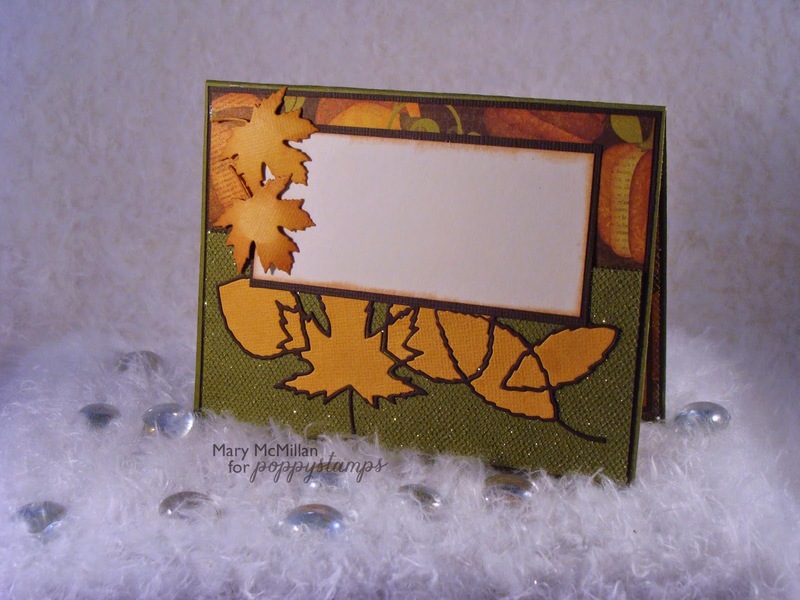 . . absolutely wonderful Fall (Autumn) card! I love the nature's jewel like colours at this time of year. 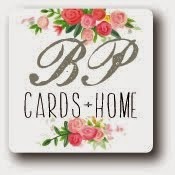 I love the colors and layers in your card! So pretty! 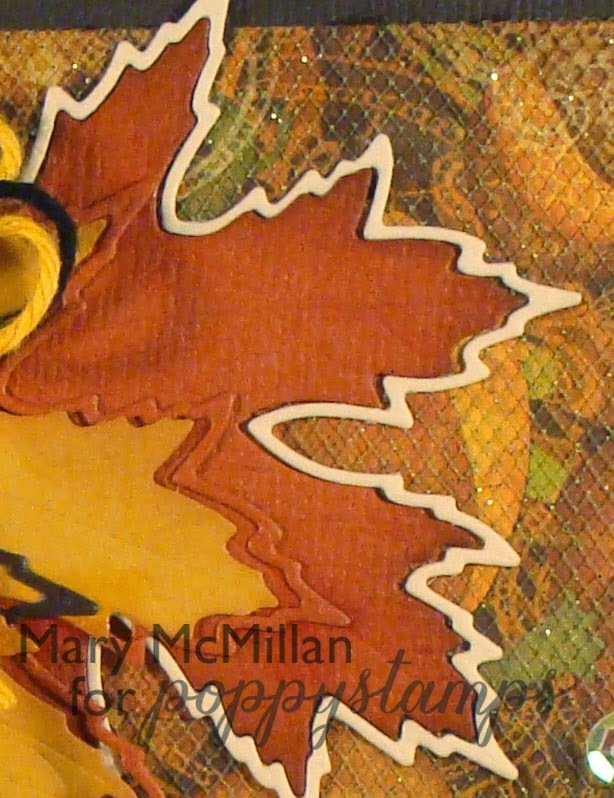 Gorgeous fall card, and that leaf die is awesome! Love your Autumn card. The colours are glorious. Hugs Mrs A. Another beauty Mary. Love the colours and the maple die is wonderful. There's a very upmarket sub near where I live called Autumn Park, I guess Fall Park just didn't cut the mustard, lol! I LOVE THIS CARD!!! Love the technique with one of my favorite Poppystamps Dies (the Maple Leaf). Best wishes! Hi Miss Mary! You already know I think this is amazing! Even the inside is gorgeous! I have a question , I will email you.